Now, we did the next step. 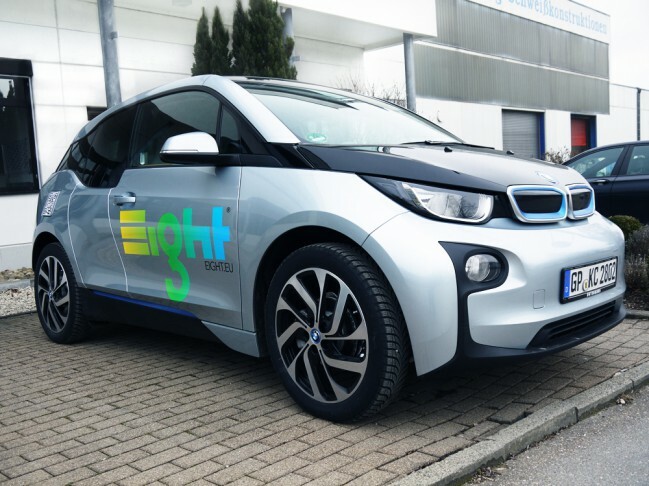 Instead of petrol or diesel the new company car from EIGHT relies 100% on an electric engine. This is (one of the many things) the BMW i3 offers – and it´s an excellent engine. The electromotor of the i3 is perfectly designed for urban traffic and comes with 170 PS and a turning moment of 250Nm. The full turning moment is available – typically for electric engines – as soon as you step on the accelerator. This results in amazing acceleration: It only takes less than four seconds to get from 0 to 60 km/h and 100 km/h are a reality after just 7,2 seconds. Besides the “Freude am Fahren” – (“Enjoy Driving” – the corporate slogan of BMW) – the BMW i3 offers so much more, which is why it matches so perfectly with EIGHT and our solar charging station Point.One. If you take a look at the media coverage about the BMW i3 you will find all keywords and descriptions that we have considered when developing Point.One: “re-invent urban mobility”, “sustainable driving”, “visionary design”, “intelligent and convenient” …to just mention a few. Since a couple of days the BMW i3 is now a daily guest on our company´s car park – and BMW has not promised too much. The car is really good fun and the perfect proof that e-mobility is not only the future but also – and already – today´s reality. 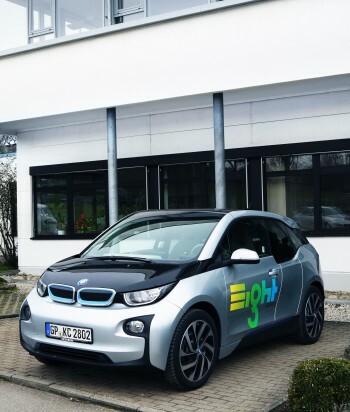 To make the car a real agent of EIGHT we have put our logo and a QR-code on it so people who´s attention gets attracted by the car will have a look at us and our solar charging stations, because Point.One and BMW i3: That is a perfect match!